Later that night I had Festive Cheesedogs. The cheesedog is all about faith. Faith in its really being made out of meat (you just don’t want to think too hard about what kind of meat, or if you do, not to discuss too thoroughly what offal consists of), and that it also has cheese. However, the cheesedog is handy, and can be consumed without the benefit of bread. 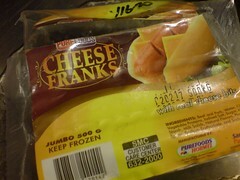 You must consume cheesedogs two at a time. Eating only one leads to feelings of deprivation which will only make you want to eat something else, leading to a dangerous food spiral which may result in you becoming morbidly obese by the next morning. Eating three or more cheesedogs in one sitting, however, is overdoing it and will not result in a food spiral but possible late-evening indigestion. Being a processed meat product, and one priced to appeal to the quantity over quality market, the cheesedog has to go through various procedures to look like a real sausage, which it isn’t -not quite, anyway. 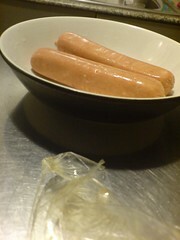 For example, the type of cheesedog illustrated above, is encased in a kind of industrial plastic condom, which should be eased off the cheesdog prior to cooking. 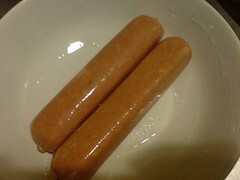 It is quite possible to cook the cheesedog while it’s still in its industrial condom, but it makes removing the condom more difficult prior to consumption. It is also possible, theoretically, to eat the industrial plastic sheathing but I don’t see why you’d want to do that. The cheesedogs, post de-sheathing, and the discarded plastic sheaths, are illustrated above. It’s a good idea to pierce the cheesedogs several times with a fork, if only to prevent their becoming deformed during cooking. Microwave on High for 1 minute. Remove from the Microwave. 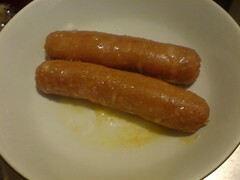 Marvel at the oily goo that has leaked out of the cheesedogs during cooking. The fussy consumer, at this point, could add to the pile of dishes waiting to be rinsed, by moving the cheesedogs to a plate, to divorce them from the oily goo. But the goo’s actually tasty and at 2 a.m., it’s not worth doing the degooing. 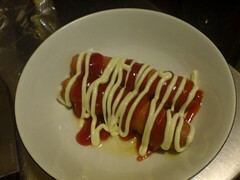 And so, apply liberal amounts of tomato ketchup and Kewpie Japanese mayonnaise*, for that festive look and added flavor! Enjoy by piercing one cheesedog with your fork and swirling it around your festive sauce. Repeat until everything’s consumed. *Kewpie Japanese mayonnaise is a basic bachelor food group, in the league of essentials such as tomato ketchup and hot sauce. Eating three or more cheesedogs in one sitting, however, is overdoing it and will not result in a food spiral but possible late-evening indigestion. arbet: it is pointless to keep footlongs in the fridge. they’re just stunt food for when people are eating out. But my mom buys them from time to time. She figures she could save some pesos by getting one or two, then cut them into smaller parts for day-to-day breakfast or meryenda. – LOLz. I consume 3 cheesedogs in one sitting but didn’t get indigestion. Hehe.I haven’t tried eating it late at night, though. @Prudence Don’t get me started on cocktail hotdogs! I can consume almost a kilo, my heart and arteries complains everytime when I do that!